Shaelee Tripp brings a bright smile and even brighter ideas to Radi to Write’s Intern team. 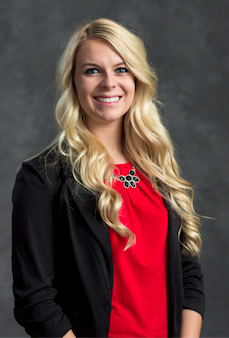 She works hard, balancing course work with jobs and extracurricular activities on campus and in the community. Read on to learn more about Shaelee and how her parents helped her navigate the transition from high school to college. Clubs & extracurriculars: I am part of Marketing Club, Human Resources Club, and Communications Club. I also work at American Eagle Outfitters and Wolters Kluwer Financial Services. Fun fact about you: I love to crochet am working on a blanket right now. Best thing(s) your parent(s) did to help you as you started your freshman year: My mom and dad helped me start my freshman year by helping me move into my dorm and get it all situated to make me feel at home. They also helped me find my classes prior to the first day of school so I wasn’t lost. Best item(s) to receive in a care package: Chocolate, popcorn, gum, letter from your parents, and chips. What suggestions do you have for today’s PARENTS as they face the high school-to-college transition? I would suggest to parents to make sure that their students stay on track with doing homework when transitioning from high school to college, because there are a lot more distractions and the homework is a lot more intense and time consuming. Also, teaching them personal responisibilty such as doing laundry and keeping their space clean is essential to the transition.